PS4 Beasts of the Sanctuary: Update 22.18.8 has been sent to cert! PS4 Tenno, are you ready for the Sanctuary? Cephalon Simaris awaits your arrival in his domain. This build includes everything from Hotfix 22.17.2 up to 22.18.8 along with some handpicked goods. Once we’ve passed cert, we will be updating this thread with the official release date! Tenno and beast, red in whip and claw. 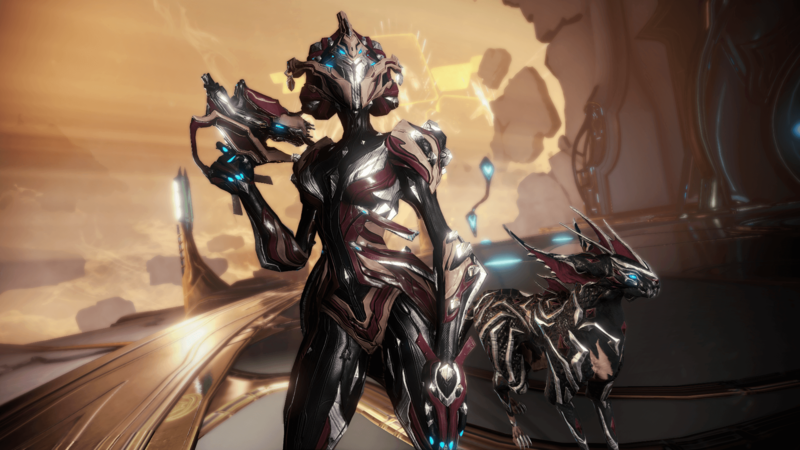 Khora and her Kavat companion, Venari, embody lethal versatility. Two bodies, one will. *The ability descriptions below reflect the changes that were introduced to Khora in the PC 22.18.8 Hotfix that will also be included in the Beasts of the Sanctuary Update on console. PASSIVE: The ferocious kavat, Venari, fights by Khora's side and provides her with a speed boost while active. If killed, Venari will reappear after a short time. WHIPCLAW: Send enemies reeling with a deafening whipcrack. ENSNARE: Bind a hapless target in living metal, entangling others who stray too close. Whipclaw will refresh the trap allowing it to capture more enemies. VENARI: Command Venari to focus on a target. Hold to cycle between Attack, Protect, and Heal postures. If Venari is killed, use this ability to revive her instantly. STRANGLEDOME: Weave a dome of living chain that ensnares and strangles any enemy within, and any foolish enough to approach. Foes outside the trap will try to hasten their comrade's deaths by shooting them. Crack Whipclaw on the dome to further damage any trapped enemies. A uniquely styled Alternate Helmet for Khora. Flowing lines meet sharpened spikes in Khora’s signature Syandana. Launch a flurry of metallic quills with Khora’s signature sidearm. Use alternate fire to change its elemental damage type on the fly. Tear through any target with these vicious, claw-like blades. The signature swords of Khora. Precise calibration, rapid trigger-pull and a steady hand all combine to bring down the hardiest prey on two legs or four. Sepfahn: A balanced Zaw Strike for Nikana and Staff weapons. A steady blade for steady hands. Rabvee: A heavy Zaw Strike for Machete and Hammer weapons. Measure twice, strike once... heavily. Dokrahm: A light Zaw Strike for Scythe or Heavy Blade weapons. Lightweight, for flash and bite. Shtung: A two-handed Zaw Grip for measured strikes and greater impact. Korb: A one-handed Zaw Grip for measured strikes and greater impact. Prerequisites: Must complete The New Strange quest. Where To Go: Talk to Cephalon Simaris at his Sanctuary in any Relay OR select Sanctuary Onslaught in the Syndicate World State Window tab. Zones: The equivalent of a 'Wave', 'Round', etc! This is a new Endless mode, thus, new terminology! Data-conduits: Portals to the simulated combat! (X) Efficiency: The means to keep a Conduit open! Braton Vandal and Lato Vandal parts and Blueprints! *Khora Blueprints were removed from Elite rewards and replaced with Radiant Axi Relics. Other Relics were moved around rotations to fit - This update will include these changes and more made up until Hotfix 22.18.8 . Operation: Plague Star is returning for a second time! Get your best boil popping loadout and head out into the Plains of the Eidolon to go face to face with the Hemocyte. Plague Star will begin the day after Beasts of the Sanctuary: Update 22.1.8.8 goes live, and will be active for 12 days. If you participated in the last occurence of Plague Star, your Operational Supply Standing will still be intact. What exactly does this mean? Any Standing you had left over will be available to use at Nakak in Cetus’ Operational Supply when the Operation goes live. You will also be able to use your Hemocyte Cystolith to build Operation trophies for your Dojo! As before, the required Cystolith costs will depend on the size of your Clan. We will be posting a detailed thread on what you need to do, what you need to know, and more! If you’d like to get a head start and prepare for the Operation now, head on over to our PC Operation: Plague Star thread. Added option to Return to Orbiter from the Simulacrum. Added 9 Fan Art Displays that were featured on Prime Time to the Codex! You will be able to Quick Melee while Spearfishing in the Plains! Increased Nezha’s Blazing Chakram base Damage to 250. Ability Strength Mods will affect both Health restore and Damage (currently just Health). Removed Excalibur’s 3 second cooldown on Radial Blind. Optimized Helios' Investigator Precept: it should find targets more than 10x faster and will no longer causes periodic spikes in frame-time as high as 7ms. Friends' current location/activity will be displayed next to their names in the quick invite panel (same as what is shown in the actual Communication > Friends list). Made spawn improvements to Kuva Catalysts to avoid getting stuck in geometry or unreachable places. Incoming Life Support markers will show in-world and flash, instead of on the minimap only. Removed Weekly Kills Leaderboards and Leaderboard Top 20 placement notification. More info on that here. Fixed several instances of the Eidolon Shrine breaking if players spammed it with Shards. Fixed Frost’s Snow Globe disappearing if a large amount of damage is taken during its invulnerable phase. Fixed Pets losing loyalty when transitioning from Plains to Cetus because they are presumed 'dead' during the transition. Fixed Mote Amp showing up as an unranked Primary weapon in Profile - should only show up as Mote Prism under 'Amps' like with all other Amps. Fixed Companion kills/assists not tracking in the profile screen. Fixed Nezha Jinza Helmet Alerts defaulting to a Nezha Circa Helmet. 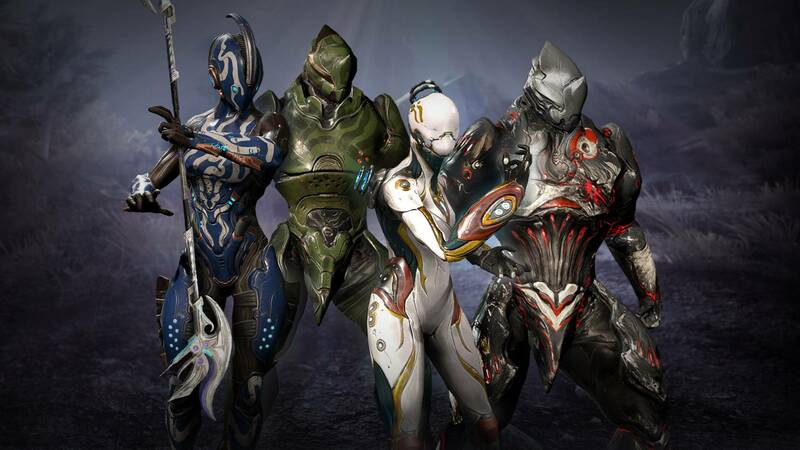 Fixed being in a perpetual loading state after accessing the Options Menu when transitioning from the Plains to Cetus (or vice versa). Fixes towards the Cetus gates not opening, resulting in losing your rewards. Fixed not getting rewards from Ghoul Bounties if they expired while you were still running them. Fixes towards cases of selected Bounty disappearing or failing when transitioning to the Plains from Cetus. Fixed Nezha’s Blazing Chakram not displaying a Damage stat in the Arsenal. Fixed Wukong's Iron Staff not getting as large/buffed as it should be for Clients during Melee combos. Fixed Smeeta’s Charm cooldown being removed if you were to Revive or be Revived. Looking forward to the new Onslaught mode, hopefully we can get a group together for collective disappointment of the Elite version occasionally for the atrocious drop rates of the 'returning' Vandal weapon varients. Mesas' new augment mod will fit nicely in her Exilus slot and a bunch of new Zaw parts gives me something to spend my standing on, even if just for mastery rank. Not too interested in the new frame or the weapons unfortunately. Not really heard too much positive feedback on anything other than the dual swords. No doubt will run the Plaguestar event again, although nowhere near as much as last time, as that was pretty fun and you could get yourself some decent rewards.
" Now with 96.5% more WuB WuB !! " We're pretty much unpacked and settled in the new house now and i started a new job last week, part time sausage roll monkey at Greggs, a jobs a job. Hopefully I'll be back to playing Warframe soon enough. It's not me, it's my brain! I'm wondering if it might be easier if I start this form the beginning again it's been that long long since I've gone near the game that I don't have a clue as to what is going on anymore. Must be well over the 2 year mark now since I last played it. By all means dive back in @IamNumber6 , the more the merrier, but god don't start again. I'm usually (Always?) on in the evening so just join in sometime and run a few missions see what you feel like after you've played it again maybe? I'm sure you still have enough good stuff that it won't matter too much. And unlocking the star chart again is harder because of some poor Archwing missions they have now, that I don't think I've played more than once. Just ease yourself back in, have a look around the place and maybe ask @Martok or @HaloJ the best way to get going again. Glad to hear things are looking 'better' @HERMAN_JELMET as obviously is been pretty ***** for you all recently. This is now LIVE ! !